If you’re searching for Halloween crafts look no further! We have put together a HUGE list of fun for you! Even though it’s over a month away, Halloween is on everyone’s brain. It’s just such a fun holiday. My kids are already making crafts and discussing all of their costume options. We’re excited to try all of these great activities! This fun recycled art project makes spiders from paper plates! Making a craft stick crow with black feathers is a great Halloween craft and let’s you get creative! If you’re feeling really crafty you could even make your own DIY Lego costume. One of the easiest preschool art projects is this pumpkin coffee filter art. It’s also really adorable. If your kids get a little spooked in the dark, you can easily help them make their very own Halloween night light. These wizard wands are fun to make and could also go along with your kids Halloween costume. Make a bouncing spider from an egg carton. Play with it or try and scare your friends! Easily make a tissue paper pumpkin filled with your favorite candy. Make ghost foot prints by dipping your kids feet in paint and pressing them on paper. Bottle cap spiders are another great craft you can make and use to scare your buddies. If you want something different these soft and spooky ghosts are easy to make and lots of fun! Trick or Treat footprint signs that are a great way to make some special Halloween memories! 13 pumpkin crafts to make and do! Make some puffy paint pumpkins to hang on your wall! Make a simple haunted house puppet theatre made out of a large cardboard box. A great way to bring a Halloween book to life by making your own skeleton! A really simple way to make some monsters using cereal boxes and your imagination! Why not make your own pumpkins with craft sticks and glue! A decoration to treasure! Looking for fun alternatives to do on Halloween? A great list with lots of ideas! An awesome fun craft to make, a peek-a-boo Frankie! It is as cute as it sounds! Do you love a wreath on your door? An arachnophobia wreath is simple and easy to make! Don’t stop with the teaching and create positive and negative Jack-O-Lantern paper crafts. Easily make a vampire out of a paper plate! Turn your handprints into Halloween spider art that you can use to decorate your home! Want to create a monster party invite to scare your friends? This is so easy to make too! It can’t be Halloween without some pumpkin spiced playdough, make your own with this recipe. Do you want to create your own monster confetti? Find out how here! Making things out of egg cartons is simple, why not try a bat! Turn those popsicle sticks into a funny Halloween Witch! How to make a simple spider to decorate your home with! Halloween inspired masks that are simple enough to make with your children! Use cotton buds to make little skeletons! Perfect for a Halloween card! Simple and easy to make. A simple and easy to make Raven wreath to decorate your front door this Halloween! Do you need help drawing monsters? These prompts will help everyone create some awesome monsters! Fun pumpkin painting and lacing up skills all catered for here! Hav fun making and playing in this simple but fun witches brew! Make your own scary witch, with just paper and glue! Simple but fun too! Science is a great way to get kids excited! Try making a diving spooky ghost! Nothing says Halloween like fun homemade Halloween scary masks! Teaching your child about bones is easy at Halloween! Try these handprint and cotton bud pictures. Make your own candy corn pictures with some pompom painting! Encourage fine motor skills with tearing ghost shapes and hanging them up as part of your Halloween decoration! Window decorations brighten up every room! Why not try these Halloween inspired decorations! Use garland to make a simple and scaredy cat that will look awesome in your home! Brighten up a boring sandwich with this simple idea for Jack-O-Lantern sandwiches. Make your very own paper plate wreath, with spider handprints too! Simple zombie finger treats is a great menu option for Halloween. When isn’t it time for slime! Make this Halloween slime with eyeballs and water beads. Science and Halloween mix well! Try making an expanding ghost balloon! The perfect Halloween accessory is a black cat! Make your own black cat using thumbprints and black paint! Shadow puppets made from card and sticks, a great way to inspire young minds. Looking for a fun garland to make? Try these Halloween inspired mummy garlands! Fill up your fruit bowl with oranges and draw on faces! It’s fun and cheap too! Pumpkin topiary, a great way to make something beautiful with recycled items and a few fake spiders! Halloween doesn’t have to be full of candy! Check out these healthy Halloween snacks. Turn a simple handprint into a scary spider! Make a spider that will entertain, jumping spiders! Sensory bins are great fun, add some Halloween inspired items to really push the theme! 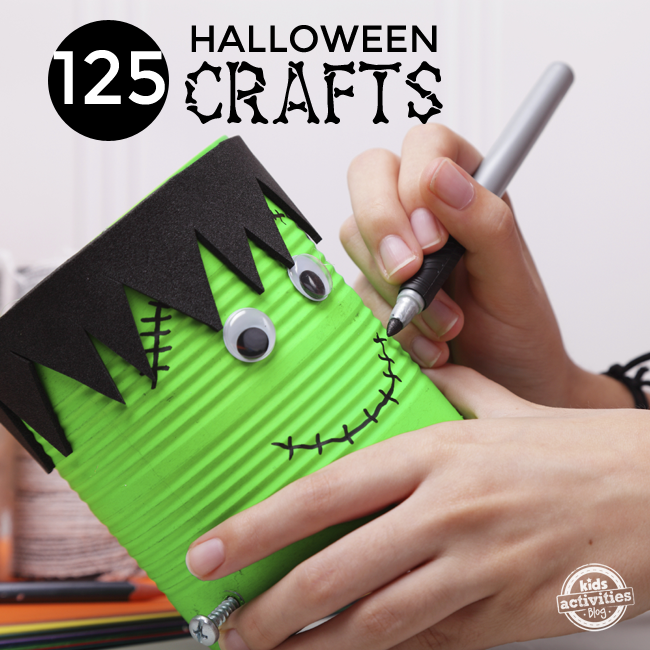 Simple craft, glue pictures these are fun when you include Halloween themes and ideas. Use wooden pegs to make peg monsters! Simple and lots of fun! Window decorations made with simple ingredients that look good and last! Threading activities are great for building skills, try these simple Halloween threading ideas. Using old CD’s to make CD ghosts look great and simple to make. Witches and ghosts that fly, well travel on floss, are so much fun! Stuck for a Halloween craft? Make these scary ghouls, quick and simple to make! Halloween themed stones on a light table to help children use their imagination! Turn those mini pumpkins into spider decorations. Fun ideas to try making science experiments with Halloween items. Need a printable Halloween count down calendar? Little bags that make a count down calendar, so cute and easy to put together! Toilet roll little black cats, ideal for Halloween decorations. Halloween suncatcher window decorations, with some free templates to help you draw. Use empty juice boxes to make these cute little monsters. Make your own handprint spiders and the spiders web. Toilet rolls make great pumpkin lanterns, simple and cheap crafting. Craft stick ninjas and mummies, simple yet cool to make! Scary doll bunting! It’s just too scary! Paper plates can be anything you want them to be! How about scary plate monsters? Don’t let the babies miss out on all the fun! Halloween painting just for them. Make your own clay pumpkins, simple and easy to make! Dancing skeletons made out of cotton buds and glue! Creating a pumpkin patch using heel prints and paint chips. Yarn wrapped Jack-O-Lanterns simple and fun to do! Plastic lid monsters, great for some fun Halloween crafts. Simple homemade containers to give out your Halloween treats. Halloween inspired playdough shapes and colors. Simple and great for stimulating fun! Button pumpkin faces, simple fine motor skills play. Using pasta shapes to paint and stick together to make some really scary monsters for Halloween! Pumpkins can be used for almost anything! Try making a solar system from a few pumpkins and dough balls! Skull luminaries that light up are great for dark Halloween nights! Glue and sticking on pumpkin shapes! Perfect for those arts and craft days. Why cut out faces on your pumpkin? Make faces with playdough! Fancy making a pumpkin geoboard? It is a lot easier than you might think! Create your own pumpkin patch with this great drawing activity. Paint your paper plate pumpkin with a loafer for more texture and fun! Awesome scary monsters, lots of different ideas to interest any child. Make your own glow in the dark window gel clings, simple and fun! Create your own jar luminaries to scare your neighbours. How about a Halloween themed ginger bread house, simple to make with candy! Black pipe cleaners made into cat shapes! Great for those younger children! Who doesn’t like playing with wooden blocks? Make your very own Jack-O-Lantern blocks. Paper chains are simple to make. You can make them more scary with your decoration! Sensory bottles are so much fun, make a Halloween sensory bottle today. Make your own pumpkin stamp with a toilet roll! They look cute too! The best activities are the ones that promote learning and new skills. Check out these Halloween craft activities. Create your own bat picture with paints and card! 5 little pumpkins book activity ideas to make the book come to life! Create your own milk jug ghost to hang in the trees. Make some cute mummies from card and paper, great sticking activity to entertain any young minds. Mummies can be made out of anything including toilet rolls and paper towels! There is nothing better than finger painting! Try these Halloween inspired finger painting ideas. Teaching other techniques and styles of art while having fun is important! Check out these Picasso styled pumpkin ideas.Picasso styled pumpkin ideas. Painting and reading about pumpkins is a great way to learn! Melting wax crayons over a pumpkin is a great way to add texture and fun to pumpkin art. Toilet tube and a glow stick are all you need to make some glowing eyes for Halloween. Mason jars can be used for so many things including pumpkin lanterns. Create a story box with all things Halloween! Pippa the pumpkin fairy book and crafts to explore the content. Finger printing art, the pumpkin patch. Just paint and imagination! A simple pipe cleaner spider with a pompom body. Pomanders, fresh oranges with cloves for the designs. Piped shaving cream mummies especially for Halloween! 13 days of Halloween tree to make for your home. Create your very own monster eye balled picture frame! Perfect for Halloween! Use the rubber on the end of your pencil to create some simple but cute ghosts! Do a dot art review and artwork. Use felt scraps to create monster puppets for all ages. Awesome monster slime ready for Halloween fun! Create simple mummies with yarn and stiff card and googly eyes. 14 Halloween inspired toilet roll art and craft projects. Inspired by Halloween arts and craft ideas that are simple and fun to make. Funny faced pumpkins faces cut out of magazines and stuck on pumpkins. Surprise balls, streamers wrapped into balls with little gifts hidden inside! White footprints can easily be turned into ghosts for Halloween. Glow in the dark glitter jars that you make at home! Create a spinning bat as part of your Halloween decorations this year! Jack-O-Lantern tea tree light holders, so cute! Make learning fun with this ghost counting game. Create your own bunting with some home made foot printing shapes. How many Halloween characters can you make from toilet tubes? Frankenstein foot print art is easy and fun! Spider web paper plate art, simple and great fun for all ages! Make your own Jello worms for Halloween. Decoupage art that adds interest and conversation to art. Handprints that can be turned into Halloween ideas. Making lanterns with paper mache and balloons! So cute too! Candy corn treat boxes, simple to make for yourself. Stained glass activity for children, tissue paper and light, simple but very effective. 14 spooky projects for you to try this Halloween. Don’t let bread tags go to waste, recycle them into Halloween monsters! Paper plate black cat art project to try! Create some finger print bat silhouettes, simple fun and messy! Wiggly Halloween crafts and DVD review. 90 fun activities that are not too scary for little ones. Do you want to make a witch? Paper plate witches for you to try! Free Halloween printable for you to enjoy! Make your own glow in the dark monster shirt! Simple cotton wool ghosts for you to make. Use cupcake liners to make your own bat display for Halloween! Create your own flying bat with toilet tubes and a few other supplies. Create your own Halloween costume craft using a picture and some black card. Use shells to make some amazing creatures you can use to scare people this Halloween! Glow in the dark scary creatures for Halloween. Turn lollies into Halloween creations with a pen! Use droppers to make some Halloween inspired pictures. Cover toilet rolls in fabric to make squishable giant pumpkins! Simple and great for decorating your home! Turn conkers into mini pumpkins using paint. Cute and simple glitter ghosts for you to make! If you don’t want to carve your pumpkins then decorate them with glitter, cute glitter ghosts! Make your own Itsy Bitsy Spider finger puppets for a Halloween themed craft! Create your own felt monsters to keep your kids entertained! Make your own black playdough and add white items to make your own scary black playdough monsters. Having a Halloween party? Make your own treat bags to give out! Have you made your own spider web before? Try this one its cool! Decorate your pumpkins by simply drawing a face on them! Googly eye printables for you to print out and have fun with! Jack-O-Lantern tea light holders, simple and yet very effective! Make your own pumpkins from clay and paint them! A decoration to treasure! Frankenstein made from popsicles and imagination. Halloween door hanging decoration, simple and easy to make! Ghost footprint keepsake to make. Turn a basket ball into an eyeball for an amazing Halloween decoration! Simple and fun pumpkin painting. Halloween night light night light made with an old baby food jar! Do you need help with carving? Get these free stencils to help you create amazing pumpkins! Make your own pumpkin stamp and get creative with your painting! Looking for some Halloween books for 3-year-olds? These books are fabulous! Make your own chopped fingers for a fun food at a Halloween party! Create Halloween themed optical illusions with your kids! Spiced Halloween spice rice box to give some extra imaginative play. Bubble wands shaped ready for some bubbly Halloween fun! Window clings that are spooky footprints! Add straws and pipe cleaners to playdough to make spiders for Halloween. Make spiders are simple and fun to make as part of dressing up! Candy corn monsters are the cutest monsters yet! Sun catcher Jack-O-Lantern style is simple to make and very effective! Have fun with your food and make some amazing edible owls. Jack-O-Lantern funny faces felt boards, funny faces felt boards, simple to make and fun to play with. Styrofoam bats to hang around your home for fun decorations. Who doesn’t like to play in slime? Glow in the dark experiments for kids that are fun! Make salt dough decorations for Halloween and make them sparkly and fun. Making your canning lids fun with these monster crafts! A ghost eating pumpkin ghost eating pumpkin craft, awesome and different! Learn how to create your very own Sheriff Callie Pumpkin. Special doggy bag treatss for those Halloween loving dogs! Make your own ghostly creatures by using your feet! Edible bacteria for you to make for a Halloween themed party! Make milk bottles into scary monster lights for the garden! Spider sandwich for lunch? Make your own spider sandwiches for a cute lunch idea! 12 super cute pumpkin crafts to make at home! Simple to make mummies made from old jars and medical tape! Make a spider ring from a pompom and pipe cleaners. Finger puppets made from felt into cute and scary monsters! Easy to make and paint salt dough Halloween decorations. Awesome and scary paper plate spiders for you to make and enjoy! A handprint ghoul banner is awesome to greet your Halloween guests. Make your own glitter spiders web! Learn about the life cycle of a pumpkin! Make your own t-shirts with ghost faces. Milk jug skeletons are just awesome! Create your own spider leg potion with these cool science experiments! Glittery spider and spiders web to make at home. Monsters made from popsicle sticks! Simple and fun! Awesome Halloween ghost nail art ideas! Halloween Perler bead patterns to make some fun and simple ideas! 12 fall decorating ideas moms and kids will love. Make some eyeball cupcakes for all your guests this Halloween! Don’t stop learning with these Halloween math activities to try! 18 kid freindly Halloween movies to watch! Make your own scary eyeball decoration out of pin-pong balls! Halloween soaps in the shapes of skulls and ghosts, awesome! Toilet roll bat crafts, simple and fun to make! Candy corn nail art, so sweet! Make your own Jack-O-Lantern scary TV monster. Perform your own brain surgery, fun and not too messy! Make a bone napkin ring for all your party guests. S is for spider headband craft! Turn paper plates into skeltons, super cute and fun. Makes a wooden monster prop for all your photos this Halloween! Turn a treat bag into a scary monster for your party fun! Bleeding name place cards will get your guests in the party mood! Make a pumpkin scarecrow picture frame. Halloween is the best time for candles. Make your own Halloween candles with these instructions. Sensory pumpkin decorations are a great way to explore texture and how things feel! Halloween clothes peg decorating fun! Sensory bin filled with Halloween fun items! Make a traveling monster felt board for hours of fun and entertainment! Halloween wreath made from an old piza box! Cronstartch dough to make Halloween decorations. Bottle cap pumpkin stamping with orange paint. Blood themed science experiements for Halloween! Painted spider on lanterns for Halloween decorations. Googly eye photo frame to hold your Halloween pictures! Using puffy paint to make Frankenstein come to life! Make a scarecrow from a toilet roll and paper! Potato printing pumpkins and other Halloween shapes. Halloween green slime nail art. Make a giant spiders web, great to learn about shapes and how hard it is to make one! Non-food Halloween treat ideas for all those who can’t eat candy. DIY pumpkin shirt, a great way to look ready for the season! Turn milk bottles into ghosts! Collect them for weeks beofre! DIY bat hairbow to make. It is really simple and fun! Easy pumpkin garland that you can make at home with the kids! Knife free punmpkin fun, paint your pumpkins instead of cutting them up! Make your own spider with a black bath pouf! Use foam cut into different shapes and sizes to make your own little monsters. Turn your pumpkins into minions! Awesome idea and they look great! Don’t eat your candycorn make it into a tree decoration! Design your own lego creations and make some simple Halloween lego shapes. Turn your pumpkin into a little Yoda! Create some clasical pumpkin art and make this home decoration! Thomas the train pumpkin tutorial! This glow in the dark craft is perfect for Halloween! From Inspiration Laboratories. This Halloween themed light up centerpiece will be a hit at all the Halloween parties! From Sunshine and Hurricanes. Make a candy corn themed painting! From Crafty Morning. S is for spider. Make a spider themed headband. From Fantastic Fun and Learning. Make your windows pop with these glow in the dark Halloween window clings. From The Science Kiddo. No carve Mr. pumpkin man. So adorable. From Hands on as we Grow. From Hands on as we Grow. Make a ghost from your little one’s footprint. From Crafty Morning. Make spiderwebs that SPARKLE! From What can we do with Paper and Glue. Here is a HUGE list of Halloween crafts to make using hand prints. From Fun Handprint Art. Make a ghost using a pencil eraser! So easy. From Crafty Morning. Create your own monster using a cereal box. From Crafts with Amanda. Get scientific for Halloween. From Science Sparks. This watercolor Halloween painting is a masterpiece. From I Heart Arts n Crafts. Halloween Activities: Art, Music and More! From Sing Dance Play Learn. DIY Jack O Lantern Tea Lights. From Moms Crafters. The words spider and sandwich usually don’t go together, but this time it’s amazing. From Emma Owl. Dip your hands into the witches brew and see what surprises are inside. From Crafty Kids at Home. Use your old broken crayons to make a unique looking pumpkin. From Emma Owl. A Jack O Lantern can be used to make a solar system. HOW COOL!?! From Practical Mom. Instead of candy try giving these away to trick or treaters. From East Coast Mommy. Make a purrfect black cat for Halloween. From Off the Shelf. Spooky lanterns for Halloween. Your kids will love making these! From Practical Mom. Do the monster mash with this felt board tutorial. From Crafts by Amanda. Turn your toy blocks into monsters for Halloween. From Adventure in a Box. Make a Halloween banner from your hand prints. From Crafts by Amanda. Make your pictures wear Halloween costumes. From Off the Shelf. Clothesline + ghosts = Spooky! From Off the Shelf. Make a Halloween inspired night light from a baby food jar! From While He was Napping. Turn popsicle sticks into a witch. From Crafty Morning. Frankenstein and his bride. From Crafts by Amanda. Painting rocks is the hot trend, so why not turn them into pumpkins. From Inspiration Laboratories. Use buttons to make an adorable pumpkin face. From JDaniel4’s Mom. Halloween bat art that is super simple to do. From Mini Monets and Mommies. Bone appetit napkin ring. From Crafty Journal. Choo Choo! Thomas the train pumpkin. From Craftulate. Excavate the apple “mummy.” From Going Green in Indy. Use your imagination when creating your own monsters. From Crafts by Amanda. Free monster printables and note cards. From Picklebums. Make a bat using your handprint and a toilet paper roll. From Our Little House in the Country. DIY Halloween surprise balls. From CraftWhack. 5 minutes or less spider craft. From The Joys of Boys. Learning is fun with these Halloween inspired printables. From Pre K + K Sharing. Have just a little bit of paper left on your paper roll. Use it to make a mummy! From Teen Entertainment Guide. Bath pouf spider! So adorable (even for a spider.) From Crafty Journal. A green hand print can be turned into a really cute witch! From Crafty Morning. Easy Halloween decoration for toddlers. From Syncopated Mama. Bootastic felt made ghosts. From Crafts by Amanda. A cute bird mask for Halloween. Super easy to make. From Teen Entertainment Guide. From an orange juice carton to a lantern! From Joyfully Weary. A spooky science project. From Schooling a Monkey. Use pipe cleaner to make a cute little Halloween kitty. From Off the Shelf. Make a cardboard tube ghoul family. From Crafts by Amanda. Goldfish filled mini pumpkin treats. From 100 Directions. Glow in the dark Frankenstein milk jug. From Crafts by Amanda. Shaving cream mummy craft. From Crafty Morning. Make your own Halloween sensory bottle. 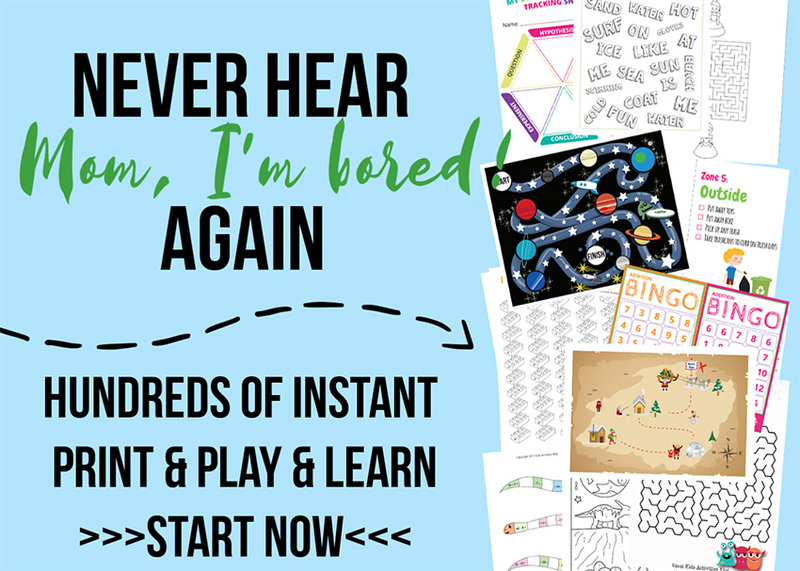 From Play & Learn Every Day. A hand print skeleton arm craft. From Crafty Morning. 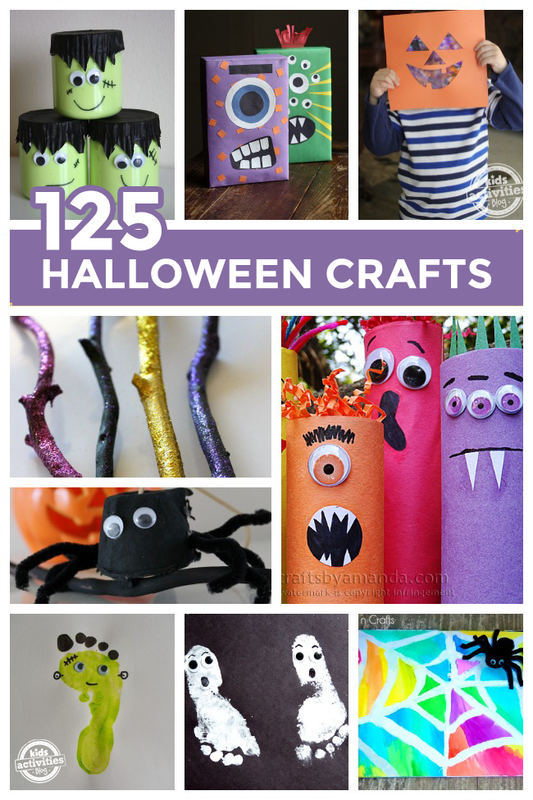 Tons of Halloween crafts for kids. From Artsy Momma. Peek a Boo! Frankie is here to see you. From Crafty Journal. Creepy crawly spider craft. From There’s Just One Mommy. Positive and negative paper space craft for Halloween. From Buggy and Buddy. Five little pumpkin counting activity. From Laly Mom. Turn a pumpkin into a geoboard. Super easy! From Danya Banya. This Halloween make a pumpkin loom. From Itsy Bitsy Fun. Spider leg potion… sounds neat! Try out this science experiment for Halloween. From Schooling a Monkey. Make those pumpkins shine with glitter! From Mini Monets and Mommies. Hang out with this bat craft. From Buggy and Buddy. Free Halloween lacing cards. From Tot Schooling. Turn your window into a jack-o-lantern. From How Wee Learn. You’ve heard of Mr. Potato Head… well here’s Mr Pumpkin Head. From Handmade Kids Art. Spooky expanding ghost. Boo! From Bitz & Giggles. Ever wanted to learn how to turn a brown paper bag into a wreath starring a raven? Well here’s how. From Crafty Journal. Make your own monsters using a paper plate. From There’s Just One Mommy. Turn your old CDs into ghosts. From Danya Banya. Make your own spooky witch with this craft. From I Heart Crafty Things. Ever wanted a BIG eyeball? You can now with this upcycled basketball craft. From Crafts by Amanda. Create this textured pumpkin patch with items around your house. From Edventures with Kids. Create a unique pumpkin while decorating it with nature! From Stir the Wonder. Use those old TVs and make a jack-o-lantern! From Crafts by Amanda. Halloween ice play! So fun. From Pink Oatmeal. Create a Halloween inspired optical illusion. From Edventures with Kids. Create your own Halloween mosiacs using legos! From Brain Power Boy. Read a book and do a craft with Winnie the Witch. From Adventures and Play. Turn a clothespin into an adorable Halloween decoration. From I Heart Crafty Things. Use canning lids to create little monsters. From Crafts by Amanda. Make little pumpkins with this toilet paper roll stamp! From Crafty Morning. Who needs a big diamond ring when you can have a spider ring? From Fantastic Fun and Learning. Create your own glow in the dark Halloween shirts. From Inspiration Laboratories. Turn your oranges into spooky oranges. From Danya Banya. Stay out of the dark with these Halloween candles. From In the Playroom. Countdown to Halloween with this ghost chart. From Edventures with Kids. Eat a pizza jack-o-lantern this Halloween. From Spaceships and Laser Beams. Stained glass Halloween craft. From Mosswood Connections. Black and white Halloween playdough activity. From Buggy and Buddy. A Yoda pumpkin? Yes it is! From Practical Mom. Halloween suncatchers. So adorable. From A Little Pinch of Perfect. Fuzzy wuzzy was a bear, but now he’s a monster! From Our Little House in the Country. Recycle those bread tags and turn them into Halloween monsters. From Crafts by Amanda. Put a spell on yourself with this edible witches brew. From Suzy Homeschooler. Halloween ghost nail art! So easy and perfect for Halloween. From Totally the Bomb. Below are the rest of the Halloween crafts collection. You can even add your own! By linking up, you give other blogs permission to link back to your site and use one photo in a roundup post. Family friendly links only, please.